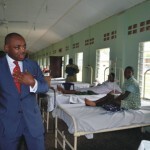 Akwa Ibom State Government (AKSG) has indicated readiness to give St. Lukes’ Hospital, Uyo a face-lift in a bid to change the face of health-care delivery system in the state. St. Lukes’ Hospital, Uyo was established in 1937 by the early missionaries is run and managed by Catholic Church, Uyo Diocese and is in a dire state of dilapidation. Governor Udom Gabriel Emmanuel, who stated this during his first official outing pledged to turn around the hospital, noting that the management of the hospital should come for discussion on the issue in an atmosphere devoid of sentiment and ego. Emmanuel, who had inspected theatre, Gynecology, Children, General, Pediatrics wards, among others, remarked, “This tour around the hospital is to show that the present government is interested in the well-being of its citizens. It is our concern and focus to have quality medical care in the state, which is why we would partner the hospital”. “The hospital has been a long-standing hospital that has served the nation and the people, which is why we need a partnership that works and not the partnership of ego or sentiments. Because we need this hospital to work and for the people to see progress, I am not interested in changing the name of the hospital but only to see that the hospital works”, the governor asserted. He said he is looking forward to hold more discussions with the Catholic community, and appealed to the Catholic Church to move in the same direction by leaving sentiments aside, stressing that the state government wants a facility that works and that the state government is working to avoid the hospital becoming a decayed facility. Emmanuel who assured the staff that the government was interested in their welfare and that they would see a total turn-around of the hospital, thanked the staff for sustaining and maintaining the hospital, disclosing that the state government would partner the Federal Government to control erosion menace threatening the hospital premises. The hospital administrator/coordinator, Rev. Fr. Charles Essien disclosed that St. Luke’s Hospital started in 1937 by the Catholic medical missionaries and is the second oldest hospital in the country, that was later managed by the church and the state government after the war before it was handed over to the church, stressing that the hospital was dwindling and needed the intervention of the state government to upgrade the hospital. Rev. Fr. Essien hinted that the hospital has the highest number of patients in the state, has 300 beds, records between 200-300 deliveries monthly, while Mboho Iban Association in California, United States of America and other concerned citizens rallied round to ensure that the local people are being saved, stressing that already medical equipment have been purchased by the hospital. He further stressed that the nurses and doctors have been working hard 24 hours daily to save the lives of the people and that the visit of the state Governor has given them hope that something good was about to happen, maintaining that they welcome partnership with the state government in order to save more lives that should not change the Catholic identity. Read the Real version at Akwa Ibom State Government (AKSG). Yea I agree with you. This visitation to St. Lukes Hospital is a sure indication that Udom will be more concerned with Health Sector.